Is Copper Mask After Rolling OK? Sarah, I know you recommend not applying any anti-inflammatory products after rolling as this would interfere with the inflammation process after rolling and thus limit its effectiveness, but i was wondering if this also applies to the copper peptide facial mask you sell? Would applying the face mask immediately after rolling interfere with the collagen induction process? Re: Is Copper Mask After Rolling OK? thanks Sarah, I did read that post but was unsure of whether the face mask had any kind of anti-inflammatory action. 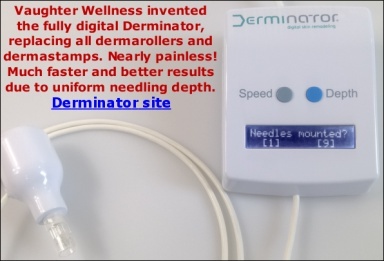 Not using anti-inflammatory substances applies only to those substances with a STRONG anti-inflammatory effect, applied immediately after dermarolling (especially after dermarolling with long needles). Some hours later, it is already OK.
Lots of substances have a very mild anti-inflammatory effect (for example certain oils) but that is not a problem. Avoid creams with steroids, all non-steroidal anti-inflammatory creams, creams indicated to relief itchiness and irritation, creams with a high percentage of aloe vera etc. and you'll be fine.